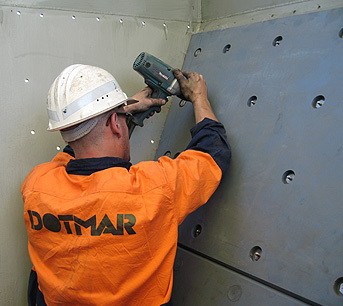 Dotmar is Australia's and New Zealand's leading supplier of UHMWPE (Matrox) flow promotion solutions to the Bulk Materials and Handling Industry. 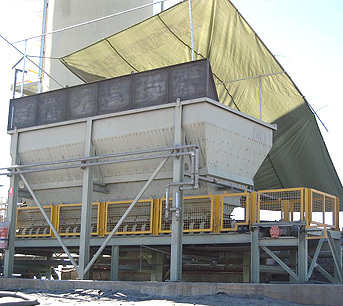 Dotmar through its long association with the bulk materials handling industry has worked closely with leading Australian Institutions to develop a range of UHMWPE plastic flow promotion solutions to accommodate a broad range of mining applications. 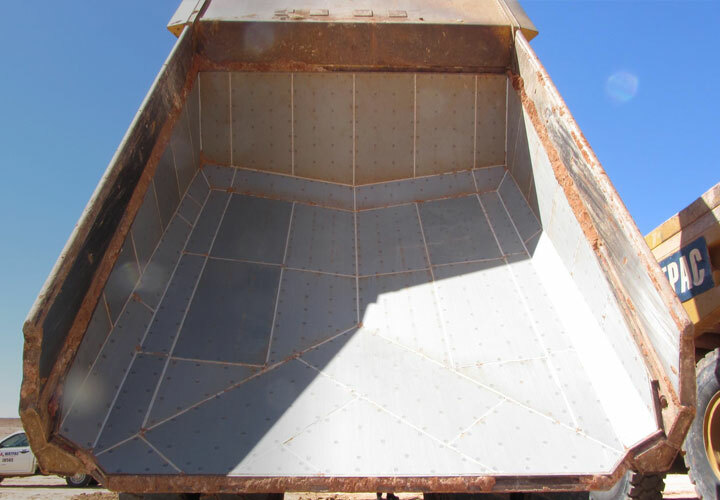 Over many years Dotmar has learnt that generally cohesive bulk materials do not flow easily in chutes and hoppers. Changes in moisture and particle size affect the products flowability. These materials stick to the hopper walls and will negatively affect productivity. Operating costs are increased and the manual methods employed of dislodging hold-ups increase OHS risks. Traditional steel surfaces also become rough and corroded over time, compounding the problems and increasing the loss in productivity. 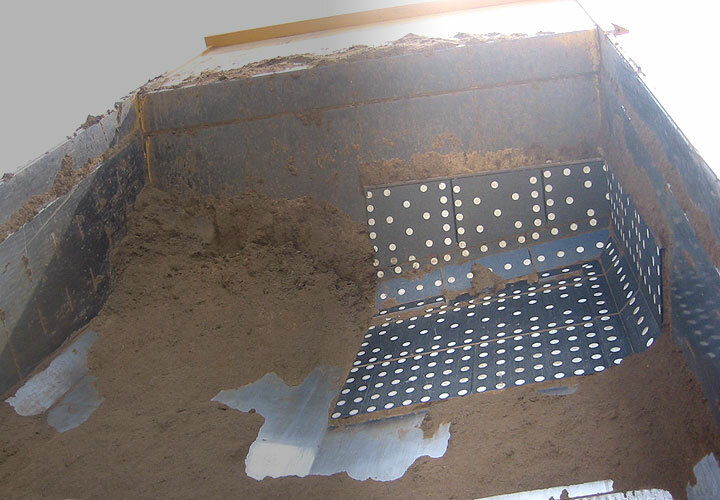 Whether it be brown coal, black coal, bauxite, mineral sands or other applications prone to material hang up, rat holing or bridging, Dotmar will work closely with the client utilising a team technically qualified staff to offering a full material selection and installation service. There are many different formulations of UHMWPE sheet available from the different manufacturers Some of these UHMWPE sheet are specifically designed for bulk materials handling for the purpose of reducing boundary friction in storage and transfer equipment. These UHMWPE grades are designed as flow promotion liners that exhibit superior surface release properties in most applications and offer high sliding abrasion resistance. Dotmar offer a range of flow promotion lining materials branded MATROX. High performance materials are being specified by engineering design consultants to meet the demands of the end users and MATROX responds by delivering best case production flow rates at optimum wall angles. Quality material, coupled with linings installed to the manufacturers' recommendations, are important components to achieve successful flow promotion and maximum longevity. In addition to our core business, Dotmar is aggressively involved in the supply and installation of Polystone Matrox flow promotion liners. Matrox liners are designed to reduce boundary friction to over-come bulk solids flow issues such as bridging, arching and rat holing. To completely understand the reason as to why Matrox UHWMPE is such a successful material in application, is to understand the importance of the Matrox coefficient of friction and the relationship of the friction angle. 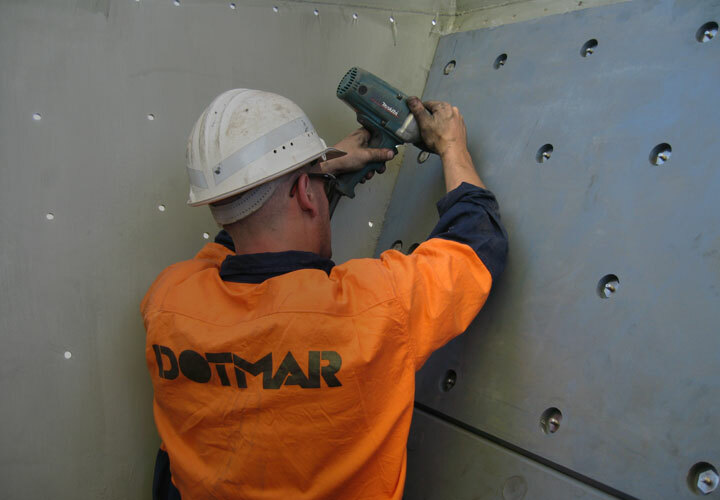 Dotmar has the specialised tools, equipment and expertise to carry out your flow promotion lining installation at any location throughout Australia, New Zealand or Asian Region. Dotmar will ensure that the lining is installed to the manufacturer's recommendation as this is critical to the performance and longevity of your flow promotion lining. 1. M8 stainless steel stud, nut and plug method. 2. Matrox capped bolt assembly. 3. Weld washer and plug method.